In this Valentine surprise your partner with a cute detail full of love, a detail that makes him or her feel special on this day. You can also give him / her some nice words that show all the love you feel for him / her, that will leave a mark on his/ her heart forever and your lover will always remember you. Then we leave some messages that you can write on a card and give it next to a present or you can send it by message through a social network on this Valentine’s Day. – “With you next to me nothing is missing, I feel complete and there is nothing else I need. I am deeply in love with you my love, you are the best and I want you to know. Happy Valentine’s Day “. – “Remember that I will always love you, I know we will celebrate together many more Valentine’s Day, that this is only the first and that our love will be stronger every time. Thank you for being by my side and for making my days happier and bearable my love. I love you so much”. – “Every detail, gesture, smile, look, kiss and hug that you give me, make me feel more in love with you, my love, feel you next to me compensates for all the bad that can happen to me. I love you happy Valentine’s Day, my love. – “My love for you is so great and so beautiful that there are no words to describe it or put a limit on it. Happy day of love my life; remember every day that I love you and that I will always care about you. I love you so much sweetheart”. 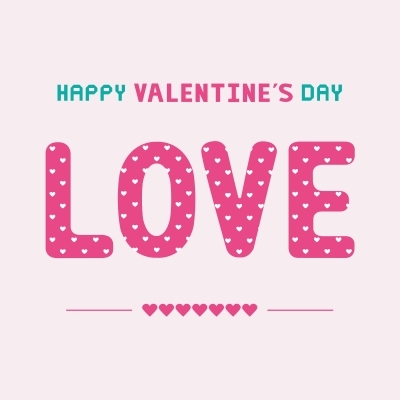 Happy Valentine’s Day to all, we wish these messages for the day of love helped you to tell your partner how much you love him / her and have made him smile and feel loved. We wish you a nice day together, full of details and lots of romance. Come back soon. There is no better way to tell your partner everything you feel for him / her than by giving them a message full of your love. Everyone on this date hope our partner will tell us something nice, that comes from the bottom of their heart and that will fill us with joy. In this opportunity we leave you some messages for Valentine’s Day that you can dedicate to your partner, either by saying it directly, through a card or a text message. – “My greatest desire in this Valentine’s day my love is that our relationship continues to grow stronger and our love grows with every kiss we give to each other. Happy day my love, never go away please, I love you so much, my life “. – “Thanks to you and your love I see life in a different way, you taught me to see things from another angle and easier than I thought. I want to thank you for everything you do for me and for the love you give me every day. Happy day my love”. – “I want you by my side to be the happiest woman in this world, and that on this day of love you let me show you everything I feel for you and make this day unforgettable for both of us. Remember that you are the owner of my heart and my mind, honey. – “You are the woman with whom I want to spend the rest of my life, you are the person that is on my mind day and night, to see your face every morning when I wake up is what I most desire in this world. Happy Valentine’s Day Love “. We hope that with some of these messages you can tell your partner how much you love him / her, how important and valuable she is to you and how happy you are. We want to spend a beautiful Valentine’s Day and unforgettable moments with your partner. Come back soon. If you liked this page you can help us by giving us a “like” on facebook, G+, twitter. Also if you want you can help this website by sending your Valentine’s Day messages, and will be published, others friends will thank you .